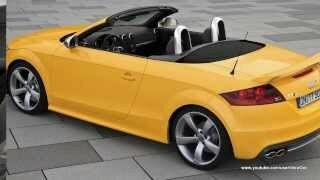 Audi will celebrate the production milestone of 500,000 Audi TT cars with a special edition 2014 Audi TTS Roadster Competition which will be sold in only 500 units and will be fast and exclusive. The Roadster TTS Competition will be exclusively available in special paint finishes of Imola Yellow or Nimbus Gray and on the exterior it will have a fixed rear wing with bars in a matt aluminum-look finish. It rides on 19-inch wheels featuring a five-arm “Rotor” design. 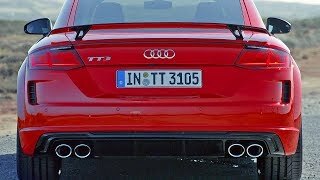 The 2014 Audi TTS Roadster Competition will be powered by the 2.0-liter TFSI engine delivering 272 HP (200 kW) and 258 lb-ft (350 Nm) of torque. When paired with the six-speed S tronic, it sprints from 0 to 100 km/h (62.14 mph) in 5.5 seconds. With the manual transmission, this same sprint takes 5.7 seconds. The Roadster consumes 7.9 liters of fuel per 100 kilometers (29.77 US mpg) when equipped with the S tronic and 8.1 liters per 100 kilometers (29.04 US mpg) with the manual. Production will start in October.